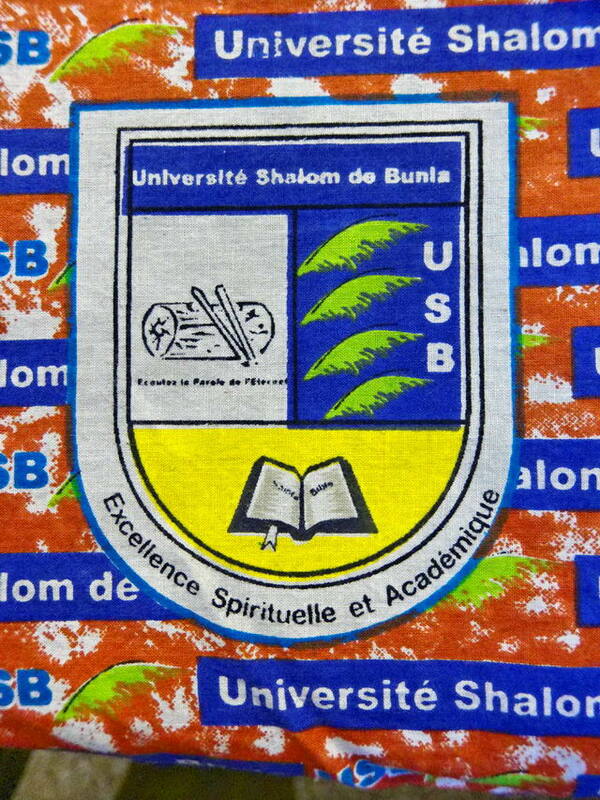 In West Africa, the cloth you wear carries a message, but not at all in the same way that it might in the USA.. While some people wear western cloth and western-style clothes, most people wear cloth made in their country, or a neighboring country. It is light weight cotton, printed in bright colors and sold in stores and even little open-air markets in rural areas. New designs are constantly coming out. When they do, they often acquire a name packed with meaning. Few clothes are ready-made. The cotton cloth is quite inexpensive. 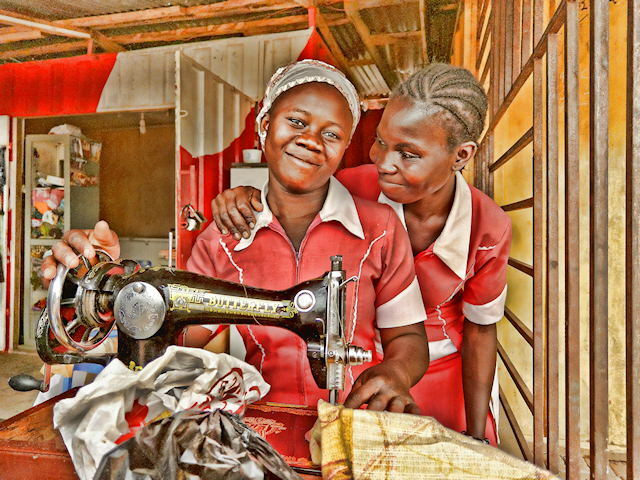 Plus, there are tailors and seamstresses everywhere. You can hear the sound of their treadle machines (from China) in the most remote areas. Tailor-made clothes are cheaper than store-bought! So men and women pick out a cloth they like and have it sewn into a design they like. The designers working for the textile manufacturers are constantly at work. If you are willing to pay for a modest-sized run, you can work with one of their designers to produce a design you like. So a company, or a church, or a civic organization can have cloth made with its logo. Because cloth has meaning and because you can have it made with your logo, it can be used for advertisement. You can have thousands of people walking around displaying advertizing your brand, your church or your organization. Even people who do not know how to read can identify which cloth is associated with which church or other organization. 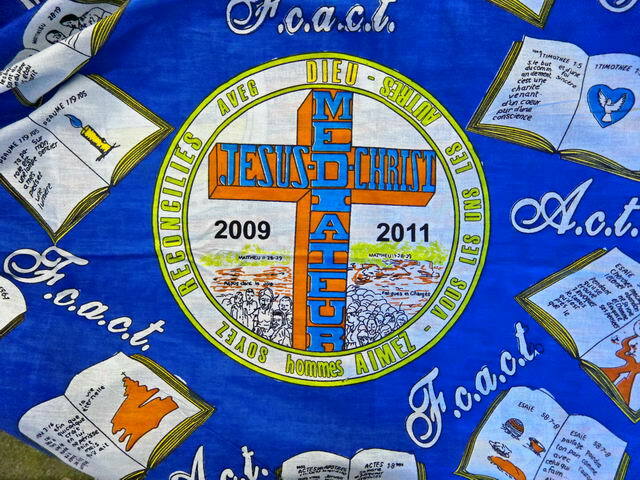 People like to buy the cloth associated with their church or civic group. So the women’s organization for a church denomination might have cloth made and all the ladies who have the means will have an outfit made of it. It shows solidarity. Because of this, having cloth made for your organization is a source of revenue. The textile manufacturer will sell you a whole run at wholesale and you resell it to your members at retail. They pay no more than for any other cloth, and you get money for your activities. The Ghanaian organization I work for is celebrating its jubilee year. Of course, this could not be commemorated without 50th anniversary cloth. Staff worked with the textile company to produce two potential designs which were shown to the staff and a winner selected. All of the staff bought the cloth. At the first 50th anniversary celebration, people were dressed in almost as many different styles as there were people, but made of the same cloth. 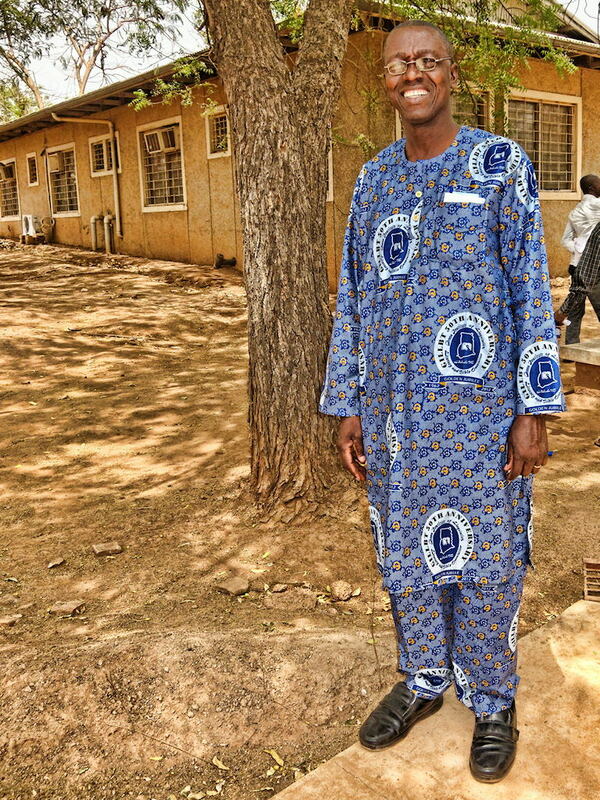 Over the coming months people who want to show their appreciation for GILLBT’s work in Bible translation and literacy in Ghanaian languages will buy the cloth and have outfits made so that they too can make a public statement of support. I have had fun imaging what might happen if we did the same in the US. One might see Republican and Democratic party cloth next to each other in the checkout line. This entry was posted in Congo, Culture, Faith now, Ghana, Religion and tagged African cloth, Chad, cloth, Congo, Ghana, Ghanaian dress, meaning, seamstress, tailor, Tchad. Bookmark the permalink. Thanks. I knew there must be a reason why often it seem all the women at a church gathering are wearing outfits of matching cloth. Kind of a cool idea. Hmmm..what kind of a design might I come up with for cloth to share with all the ladies at Takilma?? get hottest updates, so where can i do it please assist.